This Masada exclusive Dead Sea Mineral cream contains Eugenol from clove oil as a natural, anti-itch topical anesthetic to temporary relieve psoriasis symptoms. This is a totally natural cream and works best when applied after a soak in Masada Dead Sea Mineral Bath Salts. Also helpful for temporary relief of rashes and itching due to mosquito and bee bites. 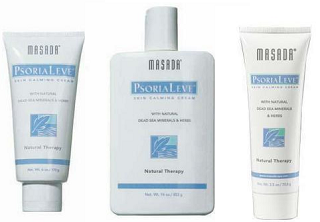 If you wish to receive a Free sample packet of Masada's Psorialeve Skin Calming Cream, email them with your name and address and we'll send you one absolutely free.